As a side dish, main course or midnight snack, egg fried rice always satisfies. Use precooked rice and a combination of oils and aromatics to create a dish that's both quick to make and complex in flavor. Finely mince the garlic cloves. Use a vegetable peeler or paring knife to remove the peel from the ginger. Mince the ginger or grate it using the finest side of a box grater. Chop the scallions and set them aside. Heat the oil in a wok or nonstick skillet over medium-high heat. Add the garlic and ginger to the hot oil. Cook for about 30 seconds, until you can smell these aromatics but not so long that they start to brown. Pour in the cold rice. Use a wooden spoon to push the rice around until it's in an even layer. While the rice cooks for 1 or 2 minutes, crack the eggs into a bowl. With a whisk or fork, stir the eggs until they're frothy. Stir the rice and let it cook for 1 minute longer. Push it to one side of the pan. Add the sesame oil to the open space in the pan. Pour in the egg and let it cook, stirring constantly, for 20 to 30 seconds or until it starts to set but is still runny. Mix the rice into the egg. Cook the rice mixture until the egg is fully set, about 1 minute. Add the soy sauce, rice wine vinegar and scallions. Stir the mixture together and cook for 1 minute longer. Before serving fried rice, take a taste. You should detect salt, slight acidity and sesame in each bite. If the rice seems too bland for your taste, add more soy sauce, vinegar and sesame oil, a teaspoon of each at a time, until the strength of the flavor satisfies your palate. You may also adjust the texture of the rice to your preference. If you like to bite into chunks of fried egg, let the egg mixture cook until it's set before stirring it together with the rice. If you prefer that each grain of rice be coated in egg, pour the sesame oil and egg directly into the rice. Stir vigorously to distribute the egg evenly before it cooks through. If you're feeding a larger crowd, make fried rice in multiple batches. Cooking more than 2 cups of rice at a time will overcrowd the pan, and too few grains will get tasty, crispy fried edges. Use a simple batch of egg fried rice as the base for any fried rice variety. Add cooked meat, seafood, veggies or cubes of firm tofu to the pan when you put in the rice. Add 1 or 2 more eggs to the rice to get stronger egg flavor and make the dish more filling. Dice one half of a white onion. Add it, plus 1 extra tablespoon of oil, to the ginger and garlic mixture at the beginning of cooking. 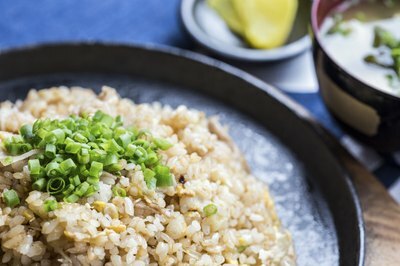 A splash of hot sauce, oyster sauce or dry sherry added at the end of cooking gives the rice savory bite. Sprinkle toasted sesame seeds or chopped peanuts over finished rice. Make fried rice a breakfast dish by substituting bacon grease for all the oil. Stir crumbled bacon into the finished rice. Adding shrimp, pork or beef and vegetables to leftover rice makes Chinese fried rice a quick and easy recipe everyone will love.